We can dispose of any tree and shrub debris you may have, quickly and affordably. Having brush and branch piles can be an eye-sore and nuisance on your property. Such tree debris, if large enough, can be almost impossible for the average property owner to dispose of. Even if you have a chainsaw, this kind of tree and brush debris is generally too small and cumbersome to dispose of by cutting. It really needs to be cleaned up with a chipper. Further, you can rent a chipper, however, the cost of that plus the truck to haul the wood waste away is cost-prohibitive. 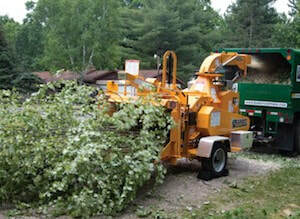 Moreover, using a chipper can be both dangerous as well as nerve-racking as they are loud and cumbersome. Eye and hearing protect are required as well as proper clothing. Save yourself the time and aggravation - call us to make short work out of even the largest brush pile and other wood debris.